(CNN) -- Reggina have become the first side to be relegated from Serie A this season after losing 1-0 at Italian Cup winners Lazio on Wednesday. 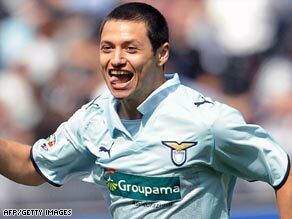 Mauro Zarate proved the match-winner as Lazio sent Reggina down to Serie B with a 1-0 victory. Mauro Zarate scored the only goal in the 26th minute when he cut inside from the right and poked the ball under goalkeeper Christian Puggioni. The result means Reggina, who have been in Serie A for seven years since their promotion in 2002, remain in 19th place on 30 points, four points behind fourth from bottom Torino, but with just one game left. Lecce are bottom on 29 points, but they need to win both their last two matches to survive in the top flight. Bologna (33), Torino (34) and Chievo (37) are the other three teams battling to avoid the drop with two rounds of matches remaining. Wednesday's match was brought forward from the weekend to UEFA a week to prepare Rome's Olympic Stadium for the Champions League final between Manchester United and Barcelona next Wednesday.